Specializing in carriage services for weddings and other special events, our exquisite white or royal blue wedding carriages are drawn by our grand Percheron draft horses and driven by coachmen with top hats and tails. 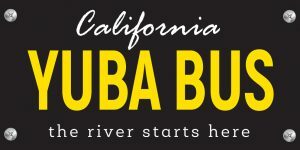 Yuba Bus, providing stress free Yuba River transportation. Safe & Eco-friendly transportation from Nevada City to and from the beautiful Yuba River- 49 Crossing Bridge. The river starts here. Our fully ADA compliant shuttle bus will depart Nevada City on the hour. Picking up at the river on the half hour. We plan on 3 pickup up locations in Nevada City. Check our website for schedule and pickup locations.